Plaids in your bedroom give a lovely luxurious look. And they are very handy to feel some extra warmth. Just put a plaid over your duvet. It doesn't feel heavy. 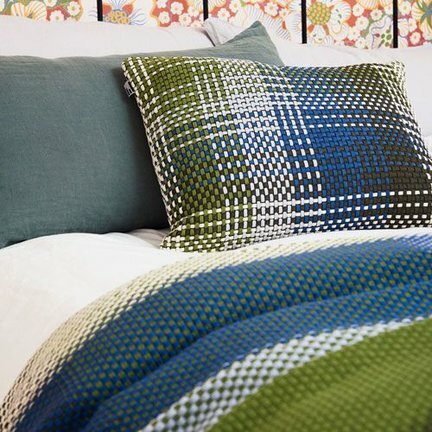 Plaids are of course beautiful home accessories in your Scandinavian interior, but you can also use them as a blanket in your bedroom. Elvang Denmark and Tina Ratzer's woollen plaids breathe and do not feel heavy on your skin. If it is cold, you can lay a plaid over your duvet as a quilt. It provides a comfortable extra warmth. Would you rather have a cotton plaid? We also have these for you. The cotton plaids of Simon Key Bertman are very colourful. And Funky Doris has plaids with a retro twist in the graphic patterns. Which one fits best in your bedroom?